I couldn't help thinking about my son and daughter. I thought about all the times I hoped I wasn't letting them down, all the maternal sacrifices I made because of work and all the work sacrifices I made because of motherhood. As always when the subject comes up, my thoughts turned to Springfield, Illinois in 2004. The picture that comes to me is my office in the State Capitol building, at the far end of the rabbit warren behind the ceremonial Office of the Governor. It was late at night and I had the lights off. I was keening in the dark. I worked for the Governor of Illinois back then. The state capitol is in Springfield, but I mostly worked in the Chicago office. Toward the end of the legislative session, I went down to Springfield for two days, and wound up having to stay for two weeks. Here's the thing: it was May, the end of the school year, and my daughter was nine years old. All parents know that the end of the school year for kids that age is an obstacle course of parental school obligations. What did I miss as the result of being stuck out of town for work? The end-of year dance recital, the end-of-year gymnastics program, the end-of-year parent-student picnic, the end-of-year art class display, and numerous informal mother-daughter gatherings. My daughter was unhappy. I was distraught. A hot blanket of guilt descended on me. Never mind that her father was going to attend all these events. Never mind that her brother was going to attend all these events. Never mind that Daddy was going to film all these events and we would pop popcorn and make a major production of watching them when I got home. I was convinced that, because I was missing third grade year-end programming, my daughter would spend the rest of her life on a therapist's couch. After I hung up from speaking with my daughter, I was curled up in my office chair, my shoes off, my knees hugged tight to my chest, wads of soggy tissue collecting on my desktop. A sensible impulse finally came to me and I picked up the phone to call my friend Pam. Pam has a son and a daughter, as I do. Her kids are about four years older than mine. At the time I'm recalling, Pam had recently been featured in Fortune Magazine as one of the nation's fifty most powerful women in business. She was an extraordinarily effective executive and mom. Still is. You know what? You're showing your daughter something important. Yes. You are showing her that sometimes you have to do your duty. Yeah. You do important work, and some day she will do important work. You're teaching her that a fact of adult life is that sometimes you have to do your job, even when you'd like to be elsewhere. Doesn't mean that work is more important to you than she is - it just means that, on this occasion, you can't be where you'd prefer to be because you made a commitment that you can't and shouldn't break. My sobbing slowed to a few residual sniffles. I don't recall another occasion when someone else's words so assuaged my pain, so altered my point of view. It was like a storm had passed through, leaving a breeze as a balm in its wake. I don't remember the rest of that night. I assume I went back to work, or went back to the hotel and slept peacefully. Here's the kicker: my daughter, at age 22, has no recollection of that May fortnight. She has heard me tell the story, but doesn't recall it as one of the traumas of her childhood. The pain of those weeks was seared into my heart, but not into hers. If she ends up on a shrink's couch, it won't be because of this. Here's the more important part of the epilogue: my daughter has a work ethic that is second to none. She is striving in the aspiring stages of her young career, and has not backed down when things became difficult or unpleasant. You know what else? She says she's proud of me. I believe her. As we recover from two weeks of political conventions and consider our choices, here is one of the most impressive things about Hillary Clinton. 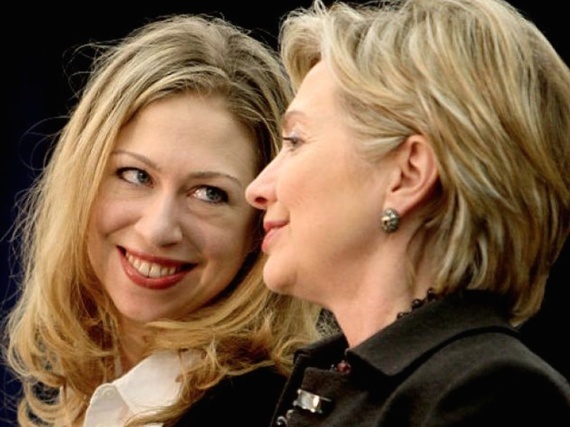 The deep bond between Hillary and Chelsea Clinton is palpable. Hillary's résumé bespeaks an unparalleled professional and pubic service career, and she simultaneously appears to have raised an accomplished daughter with attention and love and warmth and humor. We live in a world where we are often made to believe that both can't be done. Here is perhaps the greatest contribution of the woman who broke the presidential nominee glass ceiling: the proof that it can.